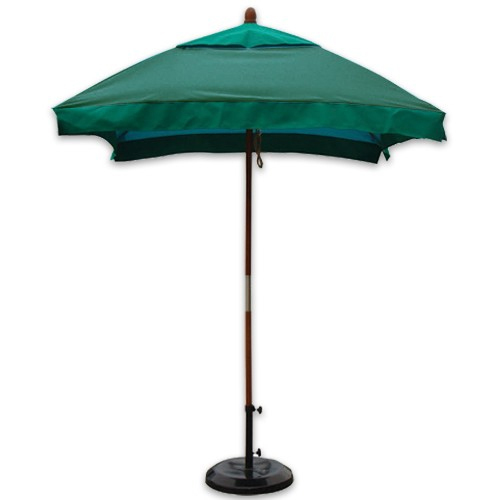 A Wind Resistant Patio Umbrella featuring Fiberglass Ribs has always been the best patio umbrella for wind available, but historically too expensive for the average family to buy. 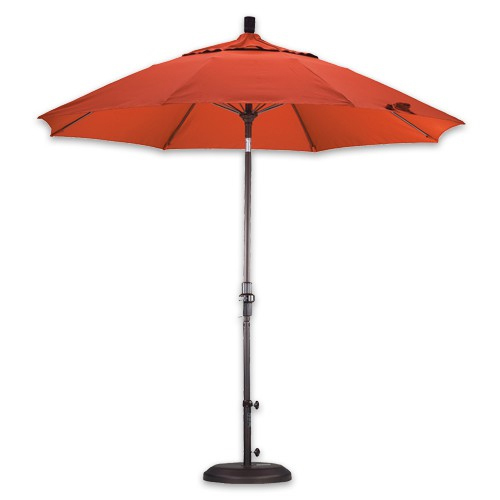 All that changes with our line of heavy duty patio umbrellas! No more broken or bent ribs from windy conditions or bad falls. The fiberglass ribs are typically 4 times stronger and up to 30% lighter than metal or wood ribs. In wind tests performed by the University of Miami, it was shown that the bending and flexing of the fiberglass ribs, spilling wind energy around the umbrella, makes it wind resistant up to 50 MPH! To make these fiberglass rib umbrellas even better, we've added a full line of Sunbrella, Suncrylic, Pacifica and Premium Olefin fabrics of guaranteed beautiful color. 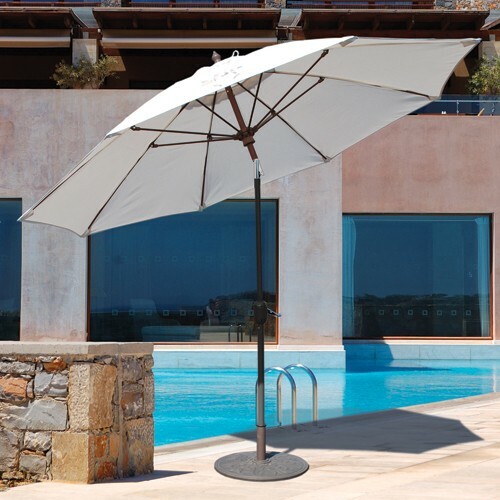 This combination of high-end fabrics and heavy duty patio umbrella material, which is highly resistant to corrosion, makes for a wind resistant patio umbrella that can last four to five times longer than aluminum umbrellas or wood patio umbrellas. Perfect for your home, or for commercial establishments like outdoor cafe's, restaurants, hotels, bistro's, or any business that caters to outdoor relaxing. 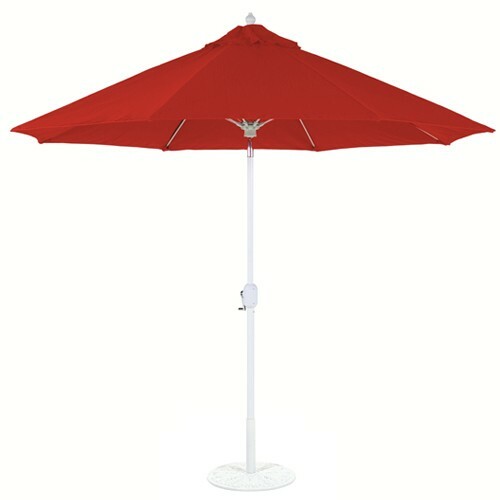 11' Wind Resistant Patio Umbrellas - Fantastic choice for larger patio tables or large shade areas. 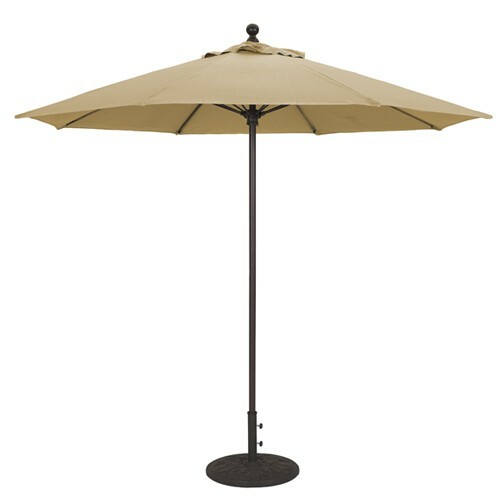 7' Wind Resistant Patio Umbrellas - The perfect choice of condo's, apartment balconies, or smaller bistro table sets. 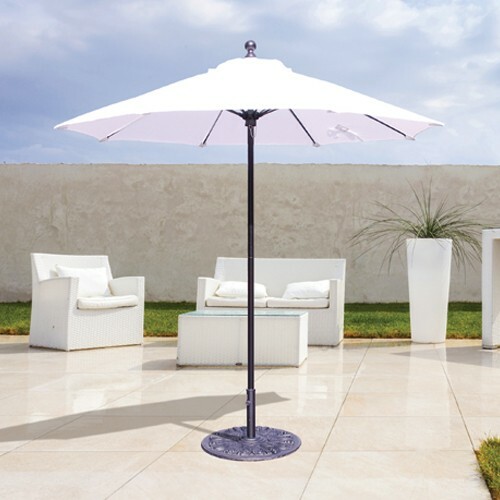 6' Wind Resistant Patio Umbrellas - If you need a small umbrella that is great for cafe tables and smaller areas, these are the patio umbrellas for you. Most folks leave their patio umbrella outdoors and unprotected about 85% to 95% of the time. We don't close them or store them away from harsh winds or rain or any of the other outdoor conditions like the sun or breezes. We especially forget about wind forces that can topple or damage our patio umbrellas. One moment the weather can be calm, the next fast winds can pick up an start toppling our outdoor decor, especially our umbrellas. The beautiful umbrellas that we've taken time to pick out and purchase usually take the most abuse. However, you can protect your patio umbrella investment with our wind resistant patio umbrellas Featuring fiberglass ribs or complete fiberglass construction. Our wind resistant umbrellas feature fiberglass rib construction which can bend and turn with the wind, absorbing the brunt of forces that normally break or bring down typical umbrellas made from aluminum or wood. The secret to these umbrellas is their ability to flex and bend with the wind and return back to their original shape. Although our standard aluminum and wood umbrellas are tough, these fiberglass rib umbrellas are designed to take the abuse, bend with the wind, and come back to their original shape. 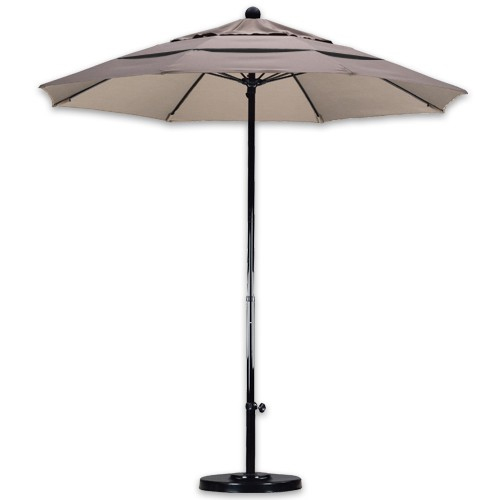 Featuring options like commercial wind resistant umbrellas for restaurants, cafes and pool sides, you will also find tilting wind resistant umbrellas for any patio decor setting, particularly auto tilt, collar tilt, and simple but effective push button tilt wind resistant umbrellas. 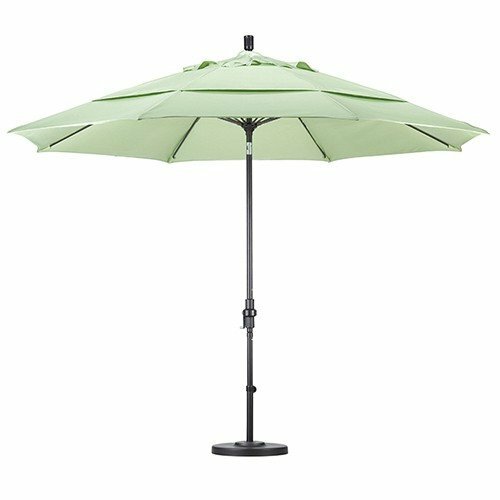 Simply stated, wind resistant umbrellas are the best umbrellas for windy areas.